On May 27, 2011 Health Canada has recalled Lithium-Ion Batteries (HP and Compaq Notebook Computers). This is an expansion on May 2009 and June 2010 recalls. This recall involves lithium-ion rechargeable batteries that are used with various HP (Hewlett-Packard) and Compaq notebook computers. Recalled batteries will be in one of the following notebook computer models and must have one of the battery bar code labels in the table shown below. If your original battery has not been replaced, it is important to validate your battery, even if validated previously. The notebook model number can be found at the top of a service label, on the bottom of the computer. The bar code label can be found on the battery after it is removed from the notebook computer. Notebook computers that could contain a recalled battery can be identified by the following model numbers and bar codes. Not all batteries matching the bar codes are being recalled. Since the June 2010 recall expansion, one new model number and several new battery bar codes have been added to this recall. Please be advised that (. in the code can be any letter or number). 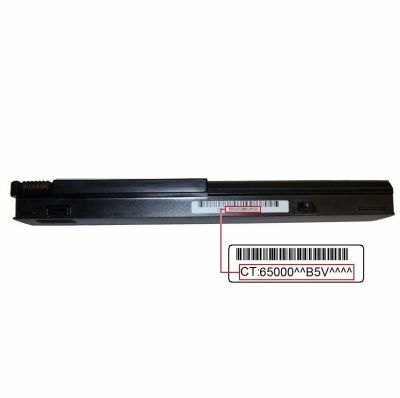 HP Pavilion Models dv2000, dv2500, dv2700, dv6000, dv6500, dv6700, dx6000, dx6500, dx6700 Battery Bar Codes 62940..AXV…., 65035..B7U…., 65035..B7V…., 65035..BGU…., 65035..BGV…. Models dv9000, dv9500, dv9700, Battery Bar Codes 65033..B7U…., 65033..B7V…., 65033..BGU…., 65033..BGV…. Compaq Presario Models A900, C700, F500, F700, V3000, V3500, V3700, V6000, V6500, 6700 Battery Bar Codes 62940..AXV…., 65035..B7U…., 65035..B7V…., 5035..BGU…., 65035..BGV…. HP (Hewlett-Packard) Models G6000, G7000 Battery Bar Codes 62940..AXV…., 65035..B7U…., 65035..B7V…., 65035..BGU…., 65035..BGV…. HP Compaq Models 6510b, 6515b, 6710b, 6710s, 6715b, 6715s Battery Bar Code 65000..B5V…. Model 6520s Battery Bar Codes 67150..AXU…. and 67150..AXV…. Model 720s Battery Bar Codes 67059..V8U…. and 67059..V8V…. The recalled lithium-ion batteries can overheat, posing a fire and burn hazard to consumers. Since the June 2010 recall expansion, Hewlett-Packard (Canada) Co. has received five additional reports in Canada of overheated batteries that ruptured, resulting in flames/fire and three instances of minor property damage with no reported injuries. To date, there have been a total of 15 reports from Canada. In the United States, Hewlett-Packard Company has received a total of 92 reports of batteries overheating and rupturing. This has resulted in 23 instances of minor personal injury and 80 instances of minor property damage. At time of this most recent recall Health Canada has not received any reports of incidents or injuries related to the use of these batteries. You should immediately check your notebook model and batteries. Batteries that are included in this recall should immediately be removed from the notebook computer. You then should contact HP to confirm whether your battery is included in the recall, even if the battery was previously checked. If your notebook is one with recalled batteries you will receive a free replacement battery. After removing the recalled battery, the AC adaptor can be used to power the notebook computer until a replacement battery arrives. You should only use batteries obtained from HP or an authorized reseller. For more information, consumers may visit the HP Battery Replacement Program website or contact HP at 1-888-202-4320 between 7 a.m. and 7 p.m. CT Monday through Friday. In total, approximately 32,000 of the recalled batteries were sold at computer and electronics stores across Canada, and online at www.hp.com and www.hpshopping.com. These recalled products were sold from July 2007 (previously stated as August 2007) to August 2008. The batteries were manufactured in China. The importer is Hewlett-Packard (Canada) Co. of Mississauga, Ontario.